This post was written for the April 2018 Carnival of Aces on “All the birds but us…” In typical Queenie fashion, I’m getting this in at the last possible second, but if you can type at supersonic speeds, consider writing a submission as well! In spring of 2014, I was assigned a portion of Lee Edelman’s No Future for a class. I hated it so much, in fact, that I vagueblogged about how much I hated it. I hated it so much that I decided that I was going to prove Lee Edelman wrong with every part of my existence. Like many things that I start as semi-jokes, it very quickly became not so much a joke as a way for me to conceptualize why what I was doing mattered. Yeah, this is it. This is the post where I finally talk about queer* futurity. 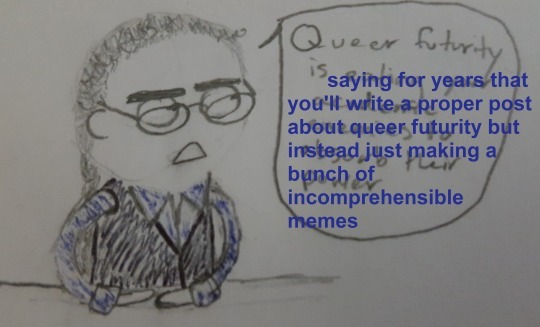 A disclaimer to start: I’m not a queer theorist and I’m not super well-versed in queer theory in general. I find a lot of theoretical work convoluted and inaccessible (both to the general public and to me specifically), and my training is primarily as a historian and ethnographer. What I’m talking about here is not queer futurity from a theoretical perspective (although there’s been a fair amount written on it from that perspective, including work actively refuting Edelman)** but rather queer futurity from a personal perspective. This month’s Carnival of Aces prompt asks, “How did your (a)sexual and (a)romantic orientations impact your (expected or imagined) future?” and this is my answer. Basically, Edelman links futurity with biological reproduction and then says that queerness’s power is negating or denying that future. There are a lot of reasons to hate this. First, there’s the weirdly exclusive definition of queerness. What about bi folks? What about trans folks? What about ace folks? What about gay folks who have biological children? Etc. etc. etc. Second, there’s the idea that the only way to have a future is to biologically reproduce. I know that Edelman has been (rightly) critiqued, especially by queer scholars of color, for discounting social reproduction–passing on culture and community to folks who are not blood relations, for example. If you want an example from my own studies, there are several medieval Buddhist sects in Japan that have master-disciple transmissions, where the master and disciple are not theoretically*** blood relations but still are part of the same lineage. Third, there’s this general sort of nihilistic, pessimistic way of thinking about queerness. I’m going to talk about that more below so I won’t go into it here. Anyway, enough about this book that I didn’t like. The first point is a bit of a weird and heavy one, so I apologize for starting with this but here goes: I don’t believe that “it gets better.” I understand that that’s often a comforting thought for LGBTQ folks (it’s the basis of the It Gets Better Project, after all), but it’s not for me. I don’t think that there will be a brighter, better future for me, because experience has yet to offer me any concrete proof that things will get better for me. I’ve known I’m queer for more than a decade, and things haven’t gotten better; they’ve just gotten hard in different ways. On a related note, as I’ve mentioned before a couple of times, I have no real felt sense of the future and no ability to conceptualize what my future might look like. Part of that is PTSD (trauma does weird things to your sense of time) and part of that is a lack of role models. This is why things like “The Path of the New Woman” appeal to me–as Ito puts it, The New Woman “does not know where this new path originates nor where it leads. Consequently, she understands the danger and the fear that attend the unknown.” The future, to me, is scary but also fundamentally nebulous and unimaginable. People often mistake me for an optimist, but I wouldn’t say I am. I don’t think the future is inherently a better, brighter place. I don’t think the sun will come out tomorrow. What I do think is that if tomorrow continues to be dark, the least I can do is make sure that whoever comes after me has a flashlight. So, for me, queer futurity is hope, not that things will get better, but that I can make them better for whoever comes next, that whatever I build (whether that’s resources or community or just plain ol’ relationships with other individuals) will live on beyond me. Needless to say, a big part of queer futurity for me is conceptualizing alternative families (found family is lovely!) but also ways to have an impact on the next generation that don’t require a family. When I was in my preteens, I saw Goodbye, Mr. Chips and I sobbed through the ending. If you haven’t seen the movie, it follows a teacher at a boys’ school from his first day teaching until his death. On his death bed, one of his colleagues remarks that it’s a shame he never had children, and he responds, “I thought you said it was a pity, a pity I never had any children. But you’re wrong. I have! Thousands of ‘em, thousands of ’em…and all…boys.” (You can find a clip of the scene in question on YouTube.) This appeals to me because I’m a sap who cries about gum commercials***** but also because it’s very much in line with how I imagine my own role as a teacher, an educator, and a mentor. I am not planning on having children–either biological or adopted. I have no intention or desire to pass on my family name–I’m not on speaking terms with my family, and haven’t been for years at this point. I’m not sure that I’ll ever be in another partnered relationship due to the puddle problem and also due to my drifting further and further into romantically grey areas. As hard as it is for me to conceptualize my future, it’s even harder for me to conceptualize a future trajectory that looks at all normative. ****** If we imagine futurity as tied to biological reproduction, I am a dead end. But here’s where I turn to queer futurity again: if the future isn’t solely predicated on biological reproduction, if my lineage isn’t constrained by my ability or willingness to pass on my genetic material, I am no longer a dead end. Because, you know what? I may never have kids and may never be part of a family, but I have mentees. I have my LGBTQ students and kouhai who’ve reached out to me for support. I have everyone who’s ever read something I’ve written and said, “Hey, this helped me understand myself better.” I have everyone who I’ve helped feel less alone or less scared or better equipped to face down the future in all its frightening, unknowable glory. I have a community I’ve contributed to building, and that will live on past me. I come from a lineage of ace bloggers and activists whose words have educated, comforted, and inspired me, just as I hope that someday my words will educate, comfort, and inspire someone else. So here’s what it comes down to: I’m excessively jazzed about queer futurity because I can’t imagine a future for myself, but I want to build one that’s better for whoever comes next. I’ve been shaped not only by my biological family but by my community, by my ace and/or queer elders, by everyone who has ever offered me a hand up or a shoulder to cry on. I’ve inherited that legacy and I’m going to pass it on, whether Lee Edelman likes it or not. All the other birds may have begun their nests, but me? Maybe I don’t need a nest. Maybe there are other ways for my existence to have meaning. *To head off the inevitable questions: when I talk about my being queer, I’m talking about both my sexuality (or lack thereof) and my romantic orientation. These things are inseparable parts of my queerness. If you are interested in reading more, I recommend checking out my tag. **Full disclosure: I haven’t read this particular book of Muñoz’s (I’ve read one of his other books) or much of the other work refuting Edelman. I’ve had it recapped to me in seminar by other folks. Like I said, not a queer theorist or a queer studies specialist. ***In actuality, sometimes people fudged their vows of celibacy and had sons who became their disciples. But biological relationships aren’t actually required or expected for transmission of teachings. *****Do you think I’m frickin’ joking? Do you think this is a joke? This is not a joke. I’m so serious about crying about gum commercials. ******One of these days I’m going to write that post on queer time/ace time. It’s going to happen. I’ve said I’m going to write a post on queer futurity for years and years and now I’m finally writing it, so the queer/ace time post will happen one day. Just not today.